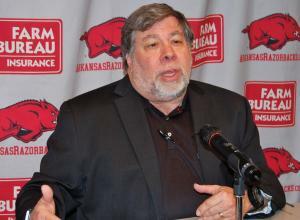 Steve Wozniak of all people showed up in Fayetteville, Ark., for a campus speech Sunday night. He spoke engagingly for a senior status wonk-nerd-geek — he is 62. Is there humility in a guy like that? Yes, after a fashion. “Woz” is certainly an electronics genius following a childhood as a certified math prodigy (literally, he tested out, apparently). He differentiated “innovations” from “inventions,” the latter being more singular and unique, the former if not collaborative then build-upons. I innovated on this, I invented that, on and on and on. He gave due credit to others, the late Steve Jobs certainly, but also Bill Gates and even John Scully. Scully ran Apple for some years and has been criticized widely, but Woz praised him. Woz repeatedly praised Hewlett-Packard, for which he worked before co-founding Apple with Jobs. The I did-I did-I did that Woz is entitled to proclaim was not boastful. He was born with gifts and from early childhood worked night and day on projects. It wasn’t so much that he’s earned the right to cast off being humble but it would be a crime for a person like him to have talents and not use them. Woz could’ve talked about anything, and it would’ve been pretty interesting, like current projects, advice to students etc. He chose the 40-minute autobiography that’s popular among public figures on the lucrative speaker circuit [Even NPR’s Claudio Sanchez reiterated his youth for area high school journalism students a few years ago who would’ve benefited more from a talk on careers]. Apple’s Steve Wozniak speaks to the media before a speech April 7, 2013, at the University of Arkansas. For a recap of Woz’s appearance, see reporter Ryan Saylor’s account at The City Wire, “Apple Inc. Legend Wozniak: ‘Love What You’re Doing.’” By the way, local TV stations also covered the talk, but region newspaper NWA Media did not. Woz was not referring to his one published volume, the 2007 memoir iWoz penned with a co-author, but hardware and software: Write the program, solder the circuit board that no one has done for the want or need you have located that others don’t seem to have worked out yet. Driving home, I reflected on Woz’s generous remarks about his colleagues that also were clear-eyed. Woz was the shy techie guru and Jobs the marketer and showman, who saw consumer interests and directed Woz to hit the workbench. Jobs of course was great at programming, and we all saw Woz not being bashful. 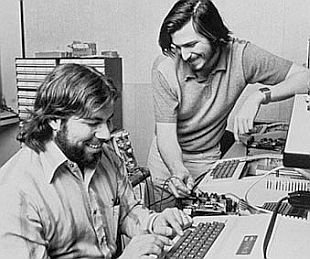 Revelation: Woz and Jobs are the John and Paul (respectively) of the personal computer device world. According to common culture, John Lennon was the quiet wonky Beatle, a bit homely, and Paul McCartney the flashier, cuter Beatle. George Harrison and Ringo Starr wrote dozens of songs for the pioneering band, but Lennon and McCartney composed its most lasting works. 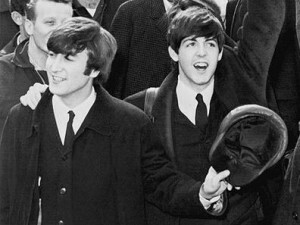 In truth, both Lennon and McCartney were strong composers and witty lyricists, working in several pop music genres. According to Woz, he had moments of marketing acumen, and Jobs could fine-tune devices and their apps. The duos’ comparison surely has been seen before, but a revelation to me. From asking people at conferences over the years I’ve learned that celebrities on the speakers’ circuit are advised to deliver one speech all the time. Two rarely. Booking agencies want their talent to deliver one multipurpose speech. It can and should evolve over time, maybe have a 10-minute version and a 40-minute version, but outside of introductory acknowledgement of the audience and sponsors, it’s the same speech. These are professionally rehearsed, including gestures and pause breaks, and it travels well. That leaves the question-and-answer portion for glimpses of the real person. Even there, booking agencies want even the Q-and-A capped to the minute. It’s in the best interests of everyone for details like this to be in written contracts. The questions asked by University of Arkansas students were broad-ranging and eloquent. [An Arkie like me tends to fret if “we” will be embarrassed at times like this. Even in childhood, I cringed when some VIP is coerced into accepting a plastic Razorback hat or waits behind a painted smile while the crowd chants Woo Pig Sooie with those arm gestures. On Sunday, UA was a broad-based land-grant research institution honoring an American icon — no nonsense.] Woz answered each question directly and with warm smiles. Yet at precisely 8:30 the UA’s gray-suited security guy, standing to Woz’s left, collected the two audience microphones. There was one student left at each pole stand. The young man nearest me shouted his question and Woz leaned from the platform to hear it, but the executive saw someone’s signal, and he walked quickly off stage. This looked like a contracted arrangement and that Woz could’ve handled it better. Most celebrities veer off the plan at times like that. But he didn’t. My analysis is that’s because he’s a geek, a geek with senior status. This Brick was typed on an Apple MacBook Pro. Hats off — and fingers on keys — to Woz and Jobs and Apple’s thousands of employees here and abroad. Nice article and tie in with the Beatles. Sounds like I missed a nice event.